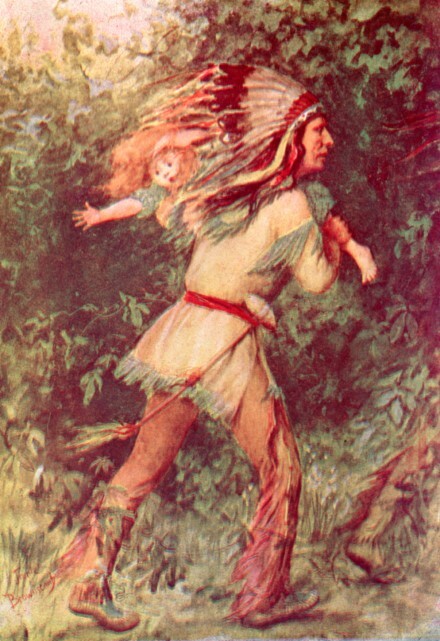 Note that the depiction above is highly Romanticized, especially the Indian’s costume. The girl’s expression of panic, however, and her bare feet, are both poignant and corroborated by documented accounts of the event. [Picture, signed Jennie Brownscombe, from the book, Frances Slocum; The Lost Sister of Wyoming, by Martha Bennett Phelps, 1916] Note first and second names of the author. who also referred to herself as Frances Slocum’s grand-niece. More on this later. Note also the Indian earrings, contrasted with the Euro-American(?) garments. This may be the artist’s liberty, or clothes Frances’ relatives brought along for her, or maybe I just don’t know the fashions of the times, vis-a-vis Indians and Whites. I am seeking the book cited above, and another related text. But it is a famous story, with plenty of on-line references. Frances was four or five years old when abducted. Sources disagree whether it was in September or November, 1778. Either way, it was months after the infamous massacre at nearby Forty Fort. The Slocum’s were not present at the fort, as they were Quakers, and, as pacifists, enjoyed generally good relations with the Indians (perhaps better than with the non-Quaker whites). There is also debate over exactly which tribe kidnapped her. Frances’ father was murdered by Indians just weeks after the kidnapping. Her mother searched in vain for the rest of her life. After she died, the brothers and sister continued the quest. 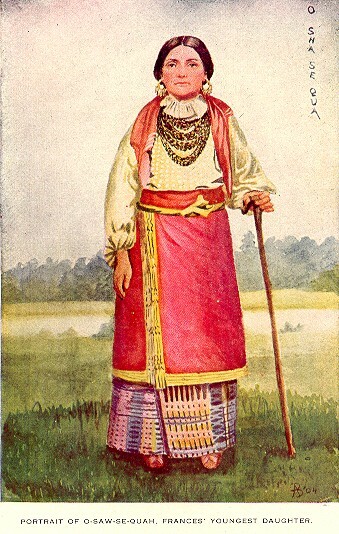 Finally, 59 years later, Frances Slocum, age around 63, was discovered living with the Miami tribe near Peru, Indiana. Her Indian name was Maconaquah, which translates as “little bear.” She was visited at least twice by her siblings and two nieces, one of whom was married to a Bennett. Frances spoke little or no English, but with the help of a translator, at least one interview with her was written down by her niece, and later published. She gave many details of her life with the Indians, her marriages to two chiefs (both then deceased), her four children and several grandchildren. Frances’ siblings and nieces pleaded with her to come with them to “civilization,” but she adamantly refused. She had lived her life with these people, they had treated her well, they were now “her” people, and she firmly wished to stay among them until her death, which occurred in 1847. I will have more to say on this after I see the two books on the subject; particularly the one by Martha Bennett Phelps, eagerly seeking the connection with our approx. 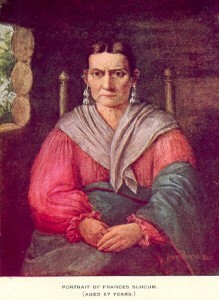 4th great-grandmother, Martha Bennett, who probably was at Forty Fort during the massacre. There are at least two public schools, a Pennsylvania state park, and other community landmarks named after after Frances Slocum. There is even an educational musical play about her, with original native-influenced music and and at least some sensitivity to the Indian perspective. This account of the Wyoming Massacre is from an 1877 publication. Here is a modern account from the perspective of Whites in a nearby region. 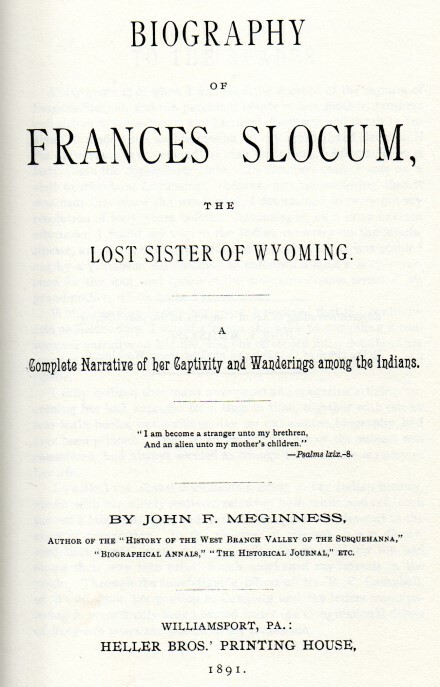 There are excerpts from “Biography of Frances Slocum …” by John F. Meginness (1891), including interview transcripts, at this site. In 1869 (22 years after the subject’s death), a reporter visited the Indian village where Maconaquah had lived, and wrote this in-depth article. For essays more in keeping with 21st-century sensibilities, one has to turn again to Wikipedia, on the massacre, and the person. 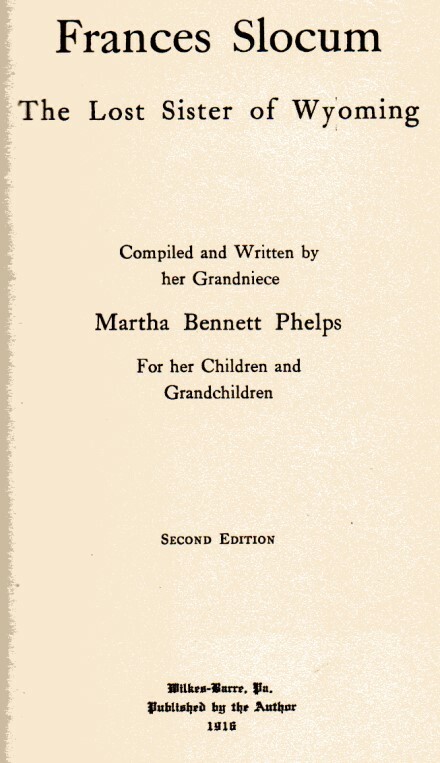 (First edition published 1906) The author, Martha Bennett Phelps (1833-1920), turned out to be no relation to our ancestor Martha Bennett, but instead is the daughter of one Ziba Bennett, originally of Connecticut, who came to the Wyoming Valley in the early 1800’s. Ziba Bennett was not related to Thomas Bennett (originally of Rhode Island), “our” Martha Bennett’s father. Ziba Bennett married Hannah Slocum, Frances’ niece. By “not related,” I mean not closer than 5th or 6th cousins, which is where we lose track of both of the Bennett pedigrees. No doubt the two families knew each other in that small community, and if they were such distant relatives, had no more idea of it than I have. Nevertheless, it is possible that Martha Bennett Myers (70 years old and very much alive at the time of the author’s birth) may have been her godmother or otherwise a namesake. The book is built mainly on anecdotes told by the author’s relatives, but also carefully tied to documentary evidence collected in the piece below. Both of the books are flawed by the racist stereotypes of the times, depicting the Indians as an ignorant, inferior race. The other book was published earlier, and as mentioned, used as a resource by Mrs. Phelps. It is a thoroughly researched, exhaustive account of the affair and its historical context, with reference to the Revolutionary War, the Indian wars, the rituals and traditions of the tribes involved, etc. etc. Among its many details are several “near-misses,” where if only Frances’ brothers had encountered certain Whites who had seen or heard of her, she might have been located much sooner. On the other hand, her adopted kin took pains to keep her undiscovered, most likely with Frances’ approval, at least by the time she reached adulthood. Also described is the action of Congress that allowed Frances and her family to remain on their land when the rest of the Miami tribe was forced westward into Illinois. The latter volume was reprinted as late as 1974, and the copy I received on loan is in good condition. The former is quite yellowed, with failing binding, and I was pleasantly surprised that the university library that owns it allowed it to circulate to me. I highly recommend both of these books to anyone who finds this tale of interest.